We only make it for special holidays. I originally wrote this post in September 2009. This morning we discovered we didn’t have enough challah to make french toast for Labor Day guests. We started calling around St Helena. Sunshine Grocery? Nope and in fact we couldn’t find anyone who knew what challah was. Model Bakery? Nope. Safeway? Nope, but the gal checked and found out that the Safeway bakery does make it but she explained they bake challah “only on special holidays… you know… like Christmas.” LOL. I’m very happy to provide this update. Labor Day 2011 must be a special holiday. 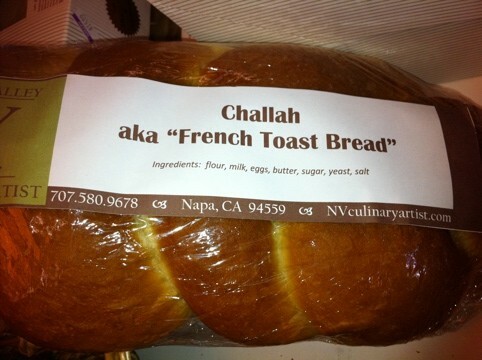 Challah has been discovered in Napa. They do thoughtfully label it so that the uninformed are not too confused. I’m not a cat person, but one can’t help but chuckle and say “Ahhhhh” when watching this video. video: The Beatles in 3000 AD. I gotta share this. What will Discovery or the History Channel be broadcasting in a thousand years? Mary Baker is a writer and marketer whom I know from wine blogs. Last year she and her family needed to provide end-of-life care for her mother. According to Mary, “It was a beautiful and empowering time. It was also physically tiring, emotionally draining, and confusing.” Mary recognized a need for an online forum where families can share information and resources with others who are facing (or have faced) similar situations. She has applied for a Pepsi Refresh Project grant of $5000 to pay for site development and get it off the ground. Please go to the Pepsi Refresh Project site and vote for her idea so she will be able to compete this important resource for families. You can vote once each day, every day in June. Bring Your Loved One Home – Providing information and practical assistance for home hospice and palliative care. Flannery Steaks… the best no matter what they’re called. 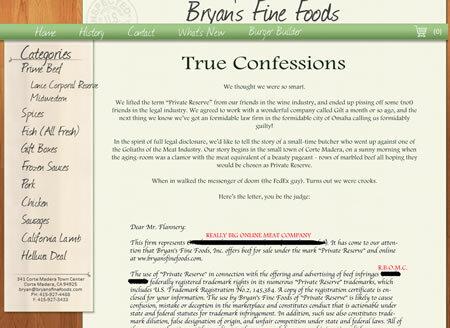 You’d be hard pressed to find better meats than those offered by Bryan Flannery of Bryan’s Fine Foods in Corte Madera and San Francisco. He’s a great guy too, well in-tune with food, wine, and the joys that go with sharing them with other fun loving folks. Read what happens when a big corporation and their legal team starts going after the little guy in this hilarious account of David sparring with Goliath. Hilarious subtitles for those who need a good laugh today. Not wine related, but it’s cool to watch live video of this hawk nest.